Michelle was Fry's last girlfriend before he was frozen. She broke up with Fry when she met Charles Constantine. Once in 2000, Bender walked in on her and Charles mid-coitus while he was under the control of scamming aliens. Michelle was later married to Charles before she fell on hard times. She froze herself, with the intention to wake in 2266, to give herself a fresh start, but instead woke in 3001 (Lars Fillmore reset the timer) and briefly hooked up with Fry again. Michelle's dislike of the 31st century led her to persuade Fry to freeze himself with her another 1000 years, which led them to a wasteland (in reality they were still in 3001 and had simply moved to Los Angeles). The pair quickly grew impatient with each other, making their relationship sour again, and she hooked up with Pauly Shore. Fry once described her as "demanding and possessive". In "Space Pilot 3000", Michelle has black hair. 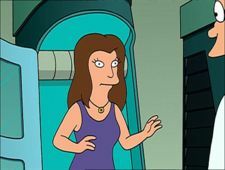 But in all of her subsequent appearances, including her cameo in Bender's Big Score where she was seen after kicking Fry out, she is a brunette. In the storyboard for "Space Pilot 3000", Fry's girlfriend was called Janet. In "That's Lobstertainment! ", "Three Hundred Big Boys", and Into the Wild Green Yonder (here) she can be seen in the audience. In "Proposition Infinity", she is seen alongside Pauly Shore at the Gearwich Village Pride Rally. In "Lrrreconcilable Ndndifferences", she is seen viewing the costume contest at Comic-Con 3010. In "The Mutants Are Revolting", she is seen dancing with Preacherbot at the 100th Delivery Party. Michelle's mother, Beth, is named after Sarah Silverman's mother. This page was last edited on 11 September 2017, at 21:39.